I recently had a conversation with Jim Carminati from Youngstown Yacht Club. 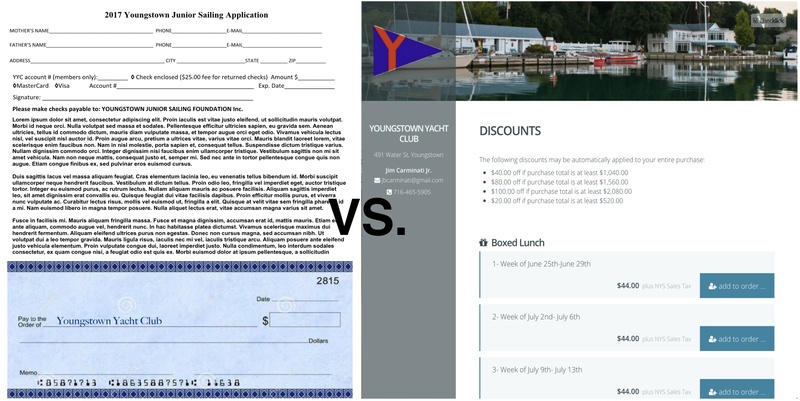 He shared an interesting perspective on switching from manual registrations (where they accepted paper registration forms, cheques and cash) to going fully online.. You may be familiar with Youngstown Yacht Club as they for many years hosted the infamous Levels Regatta. Earlier this year, after tallying up registration revenues for 2018, the club found that the number of individual sailing course registrations at their club decreased in 2018 from 2017 but their revenues increased. The key metric here is that there was no increase in course prices and it also factors in a 5% fee for any payments that were made using online registration in 2018. Huh?!? How does that make sense, right? He explained that missing cheque or cash meant that some cheques might've been misplaced and never deposited. In some cases, deposits were taken but the remaining balances may not have been paid. He can’t pinpoint exactly when the deposits were missed but the key thing is that it happened because there was a manual process in place for collecting registration payments. You might be thinking that this is a unique scenario specific to Youngstown YC and because you’re more organized, this wouldn’t happen to you. That might be true, but do you really know? You have no way to find out unless you compare year end financials for both processes. The one thing we can conclude is that manual processes executed by people aren’t perfect and are prone to errors. Ultimately, these small mistakes can prove to be costly as Jimmy found out. Prior to the summer of 2018, Jimmy and I had a consultation and it was evident that their discount structure was fairly complex. The plan was to both to simplify the structure and use an automated discount feature in the system to automate the discount process. So that’s what he did. We calculated the total revenues for each course and figured out the dollar value discount vs. a percentage based discount that they initially had in place. This made it simpler for their customers and the discounts were visible and automatically applied at checkout versus having to do a manual calculation when collecting paper registration forms. If you’re collecting registration forms, cheques and cash as payment, it’s possible that somewhere in that process, a payment might slip through the cracks and fail to make its way into your bank account. In Jimmy’s case, he thinks it could’ve been a forgotten cheque deposit, taking partial payments or deposits where remaining balances were expected to be paid at a later date. He also didn’t exclude the possibility that “I owe yous” which occur commonly may have contributed to the revenue loss. Going back to the title of this post, Youngstown YC benefited from switching to online registration and reported higher revenues as a result from taking their registration process online. So if you’re contemplating using an online registration system versus a manual process of collecting paper forms, cheques and cash, consider the resources that you have at hand and whether continuing with a manual process makes sense given that one missed cheque deposit can cost you. In addition, consider that collecting registration forms, cheques and cash requires manual admin work. You have to organize your registration forms, deposit cheques/cash and that all takes time. If you assume that managing that admin work costs $15/hr and let’s say it takes 5 hours of your time per week, that’s $75/week on admin work. If this is something you’ve factored into the cost of doing business, perhaps it’s a good time to ask yourself, is this manual process of collecting paper forms, cheques and cash the best use of your time?